well, what should I say? I didn't post anything in a while - so let's recap what has happened since May 2015, which is a whopping 13 months ago. Sit down and relax... well, I promise it won't take too long anyway. First and foremost, last November we Disjointed Studio guys released our first SEGA Master System game. 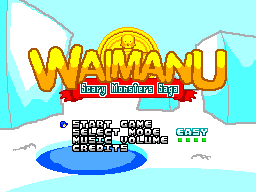 It's called Waimanu: Scary Monsters Saga (as our habit goes, the subtitle initials match with those of the console the game will be running on). You can download it here for free, and play it on your console using a flashcart/adapter such as the Master EverDrive, or on an emulator (MEKA and Emulicious are the ones I suggest). This is the first (and so far the only) game I've ever written completely in assembly... Zilog Z80 assembly specifically. I had fun doing it... well, sort of. You can read my ramblings in the 151st issue, if you can still find it. And I have to admit I'd been waiting for this to happen for quite a long time... I had purposely taken the picture that appears in the article when I was in Portland, OR (known for its breweries too)... and that was in July 2013. Oh, well... I can't really complain. All this apart, I also have spent much of my time during the last 13 months to enhance my SEGA Master System development kit and library, devkitSMS/SMSlib, which has recently reached what I would call a mature stage. Speaking of this, another thing that made me very proud happened a while ago, at the end of October 2015: the homebrew rockstars known as The Mojon Twins released their first SEGA Master System game, and they made it using my devkit. The game is called Moggy Master and it's a simple 1-or-2-player game they did to test the kit and the library, according to their blog post. They hope to code and release more games for the SMS in the future, and I hope so too. Also, we worked together to create a library for the SEGA SG-1000, the Master System forerunner, and we called that SGlib. It's now a part of the devkit. Finally, last March, during the SMSPower! 2016 Coding Competition, two more games based on my devkit and libraries were finally released along with two projects I've been working on myself. These games are haroldoop's DataStorm, a port of an Atari 2600 shoot 'em up called Turmoil, and Pedro76 and Nivarel's Master of the Labyrinth, a dungeon crawler. 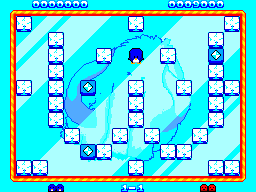 The first of my own projects is MARKanoIIId, an Arkanoid clone, which is still simply a hypnotic interactive demo and not yet a full game. It features two great tunes by Tomy, a Finnish musician and PSG essayer, and sleek graphics by Kagesan, a German homebrewer who also won this year's competition with his marvelous Bara Burū. The other project is Disjointed Studio's new effort (and a very early beta back then), which goes under the working title of Weka Invaders. Waimanu is once again defending the Earth from the next wave of alien invasion, but this time he happens to be carrying a huge weapon on his shoulders. We're actively working on this project in these very days... unfortunately, I still can't reveal any planned release date. Well, I think that's it. I should promise it won't take me another year for the next post but... well, you already know how lazy I am, right?